Cost-cutting is an important strategy for small business owners to get more out of their financial resources. With smaller budgets than the large brands, small businesses must cut where they can in order to increase profit and channel more money to their most important ventures. One area where small business owners can be ‘nickel and dimed’ is in printing, where you have the cost of the printer along with the never-ending need for paper and ink cartridges. One company that is trying to help small businesses save money with printing is Brother International, which has released the new cost-saving INKvestment printer and cartridges. 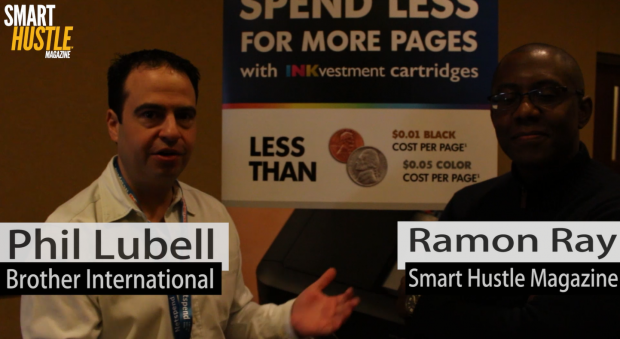 I had a chance to learn more about the INKvestment printer when I attended SXSW 2016. During my visit, I stopped by the Brother International booth for a quick interview with Phil Lubell, Senior Director of Product Marketing. As Phil mentions in our interview, saving money is important for all businesses, especially small businesses and those that are just starting out. Brother created the INKvestment printers and cartridges to give business owners an economical method of printing. The INKvestment printer is available in two models. The MFC-J5920DW, which retails for $299.99 and the MFC-J6925DW, which retails for $349.99. A reasonable startup cost will put you on the way to years of savings that will accumulate daily. Another perk of the INKvestment printer is that you don’t have to replace the ink cartridges as often as traditional printers. This seems like a trivial matter, but Brother did a lot of research before coming out with the INKvestment, and they repeatedly found that replacing cartridges is a pain point for businesses. This seemingly trivial task adds up to lost time performing the replacement, driving to the store to get cartridges, and ordering cartridges online. Phil says that one INKvestment cartridge can print Plato’s The Republic 8.6 times (roughly 3,600 pages). New #INKvestment printers from @BrotherOffice help save #business time & $$. In addition, the INKvestment printer can help boost your productivity. Mobile printing allows you to use an app to send documents from your mobile device directly to the printer. The “Scan To” feature will allow you to scan a document with the printer then directly transfer it into an email attachment. As in most of my interviews, I ended by asking Phil about his advice for small business owners. As an executive marketing a cost-saving printer, it was interesting that he gave advice on another way small business owners can save money. As Phil mentions, small business owners are always in learning mode, wanting to become better at what they do. This knowledge does not have to come at a price, though. Phil’s advice is to lean on your vendors, exploring what free resources they offer. He mentions that Brother offers free resources like information on how to create templates or business proposals and free e-books with ideas on how you can promote your business. Similarly, other companies you deal with for products and services offer educational resources, including guides, webinars and more. The overall takeaway from this SXSW 2016 interview is that if you are resourceful and do your research, you can find ways to cut costs in your small business. Stay educated with those free resources, and to save money on printing, you may want to check out the Brother INKvestment printers.